> The winners of the National Book Award were announced last night. 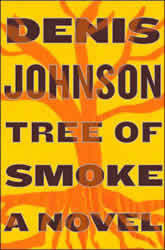 The winner in fiction was Denis Johnson for Tree of Smoke, about which I’ve been hearing great things. I’ve had some chances to buy it but I was waiting for my local independent store to get it (impatient tapping of foot). Here’s an interview.